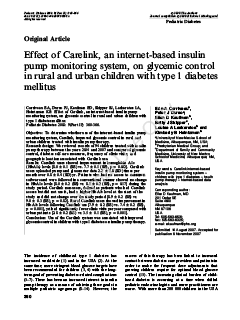 Retrospective Analysis of Carelink™ database (patient self-uploaded electronic data base) 3,141 subjects with Diabetes Mellitus who completed 3 months of SmartGuard® Auto Mode. The time spent in the target range(TIR) increased from 66.0% to 73.3%. The time spent in hypoglycaemia <3.9 mmol/L decreased from 2.7% to 2.1%. 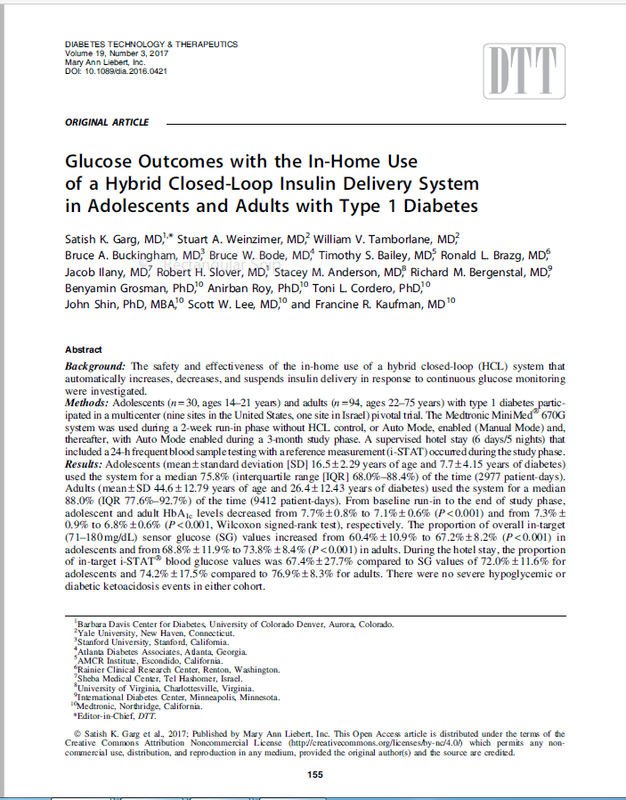 Glucose Outcomes with the In-Home Use of a Hybrid Closed-Loop Insulin Delivery System in Adolescents and Adults with Type 1 Diabetes. 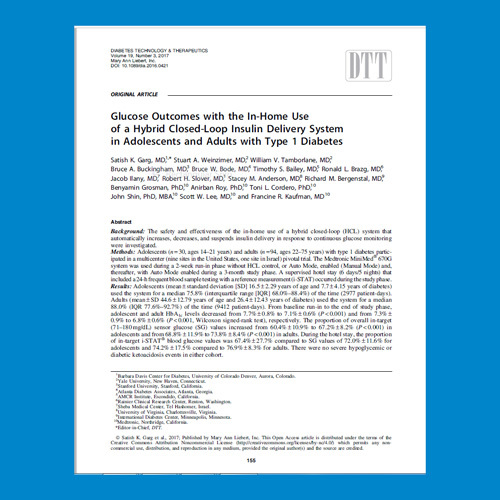 A Prospective before and after Multi-centre study assessing SmartGuard® Auto Mode vs Manual Mode (SAP) in adolescents(n= 30)and adults(n=94) with Type 1 Diabetes over 3 months. 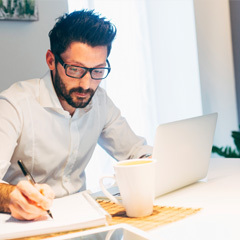 The Pivotal study has showed that MiniMed® ™ 670G can be used by adolescents and adults with Type 1 diabetes in an outpatient setting with no episodes of severe hypoglycaemia and DKA in over 12,000 patient days of use. 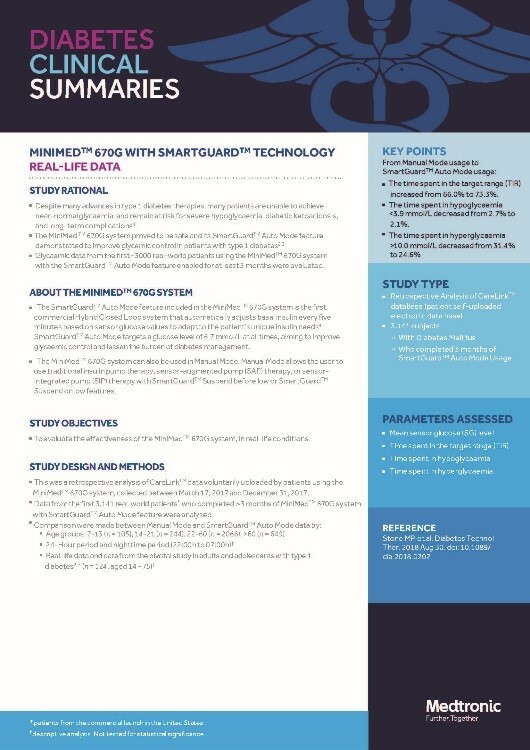 The SmartGuard® Auto Mode feature was associated with significant HbA1c reduction, from baseline, 7.8% to 7.2% in adolescents and 7.4% to 6.9% in adults. 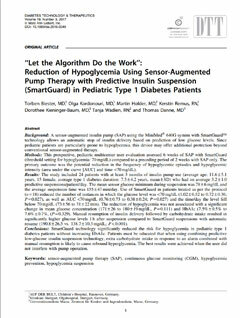 Additionally the SmartGuard® Auto Mode feature was associated with an increased time spent in glycaemic target range (3.9-10.0mmol/L), reducing both hypoglycaemia and hyperglycaemia, in both adolescents and adults. 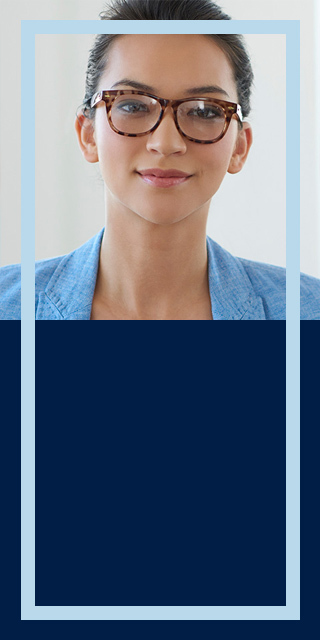 Multi-centre, unblinded randomised controlled phase 3 home trial over six months. 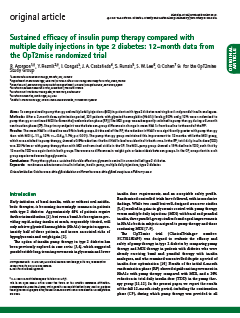 154 participants with type 1 diabetes aged 8-20 years on MiniMed® 640G were randomised to have the automatic suspend before low function on or off for the duration of six months. 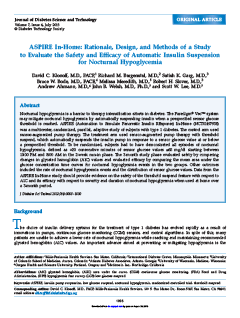 Children and adolescents spent approximately half the time in hypoglycaemia with fewer hypoglycaemic events with Suspend Before Low ON as compared with Suspend Before Low OFF. 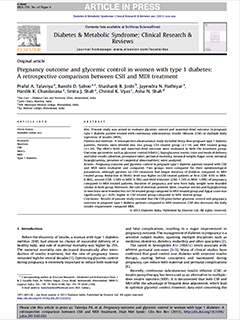 The lower hypoglycaemia exposure was consistent in subgroups of participants irrespective of age, duration of diabetes, HbA1c and hypoglycaemia awareness status. 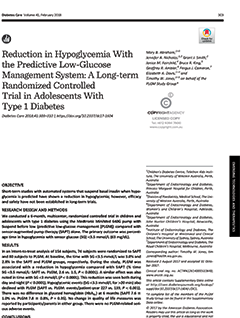 The reduction in hypoglycaemia was not associated with a deterioration of glucose control as measured by hyperglycaemia or HbA1c, nor in a reduction in quality of life. Prospective, multicentre user evaluation assessing 6 weeks of SAP with Suspend Before Low vs 2 weeks of Sensor Augmented Pump Therapy Alone (no Suspend) in 24 paediatric patients. 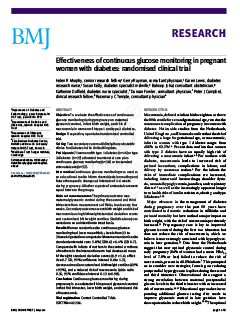 Reduced the number of instances in which the glucose level was < 3.9mmol without a significant change in mean glucose concentration or HbA1c. 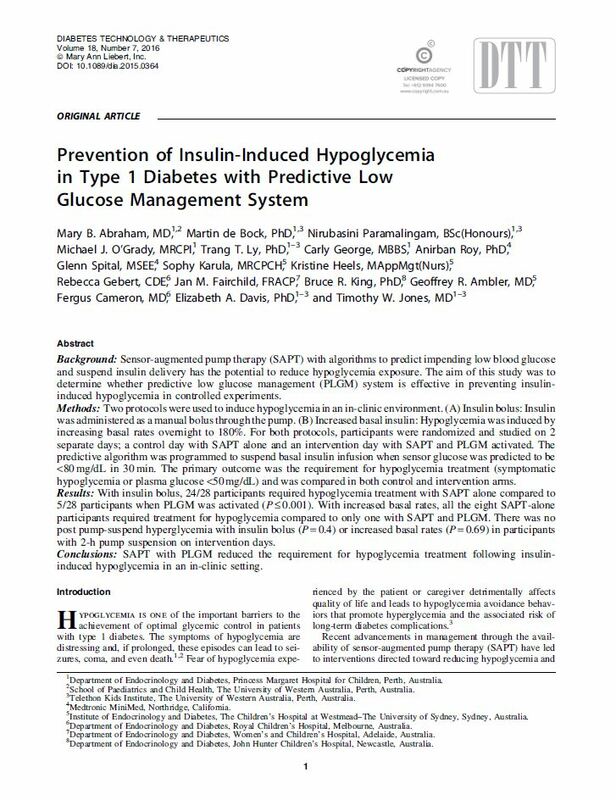 The aim was to determine the effectiveness of Pedictive Low Glucsoe Management (PLGM) in preventing insulin induced hypoglycemia in two controlled in-clinic conditions, 1. excess insulin Bolus™ during the day and 2. increased basal insulin delivery overnight. 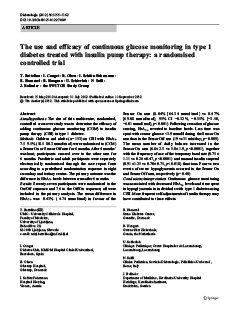 The design for the insulin Bolus™ protocol was a three-centre, randomized, controlled, crossover trial (n = 28). 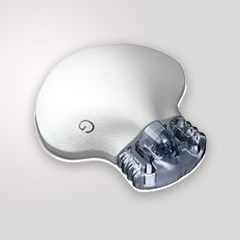 The design for the increased basal protocol was similar but a single centre (n = 8) with 180% night-time basal rates. 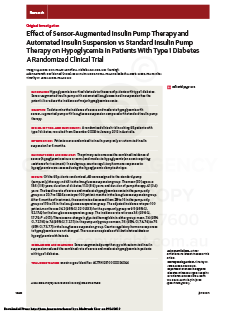 For both conditions the PLGM algorithm was set to suspend insulin at sensor glucose predicted to be <80 mg/dL (4.4 mmol/L) within 30 mins, and the control condition was SAPT alone with no insulin suspension. 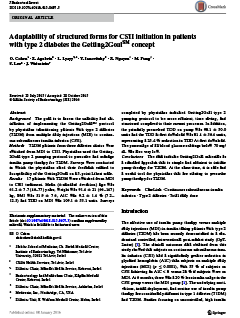 The primary outcome was need for hypoglycaemia treatment, either due to symptoms or plasma glucose <50 mg/dL (2.8 mmol/L). Choudhary. 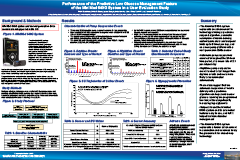 ADA Poster Presentation June 2015. 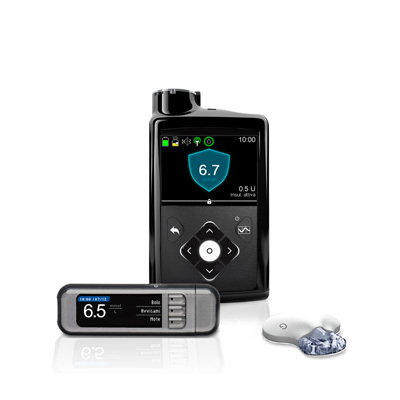 40 subjects with Type 1 diabetes were enrolled at 3 European centers and provided with MiniMed® 640G systems for 4 weeks. Danne et al. Diabetes Technol Ther. 2014 Jun;16(6):338-47. 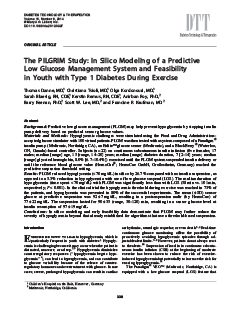 Proof of concept study with two phases, in-silico modelling and clincal study with 22 patients with Type 1 to determine the effectiveness and safety of Predictive Low Glucose Management. Ly TT et al. JAMA. 2013 Sep 25;310(12):1240-7. 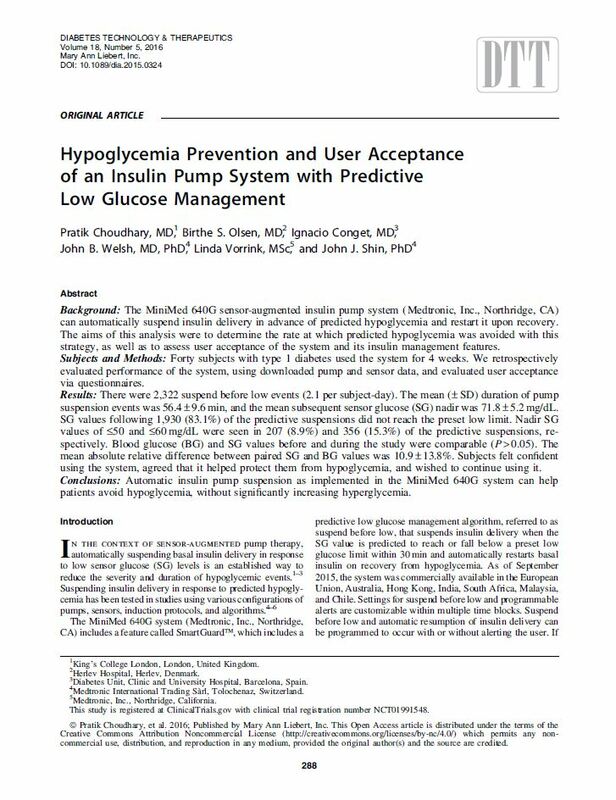 RCT comparing the rates of severe hypoglycaemia (coma/seizure) in patients using CSII versus Sensor Augmented Pump therapy with the Low Glucose Suspend feature ON over a 6 month period in 95 children and adults with impaired hypo awareness. 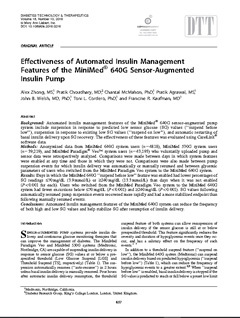 RCT comparing the sensor augmented pump therapy with low glucose suspend feature ON, vs. sensor augmented pump therapy alone, over a 3 months in 247 adults & teens in 19 US centres. Bergenstal RM et al. Diabetes Care. 2011 Nov;34(11):2403-5. 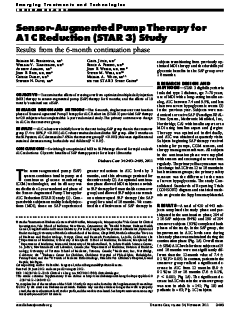 Six month single-crossover continuation phase of STAR 3 with 420 patients to determine the effects of crossing over from optimised multiple daily injections to Sensor-Augmented Pump therapy for six months and determine the effects of 10 months use of sensor augmented pump therapy. 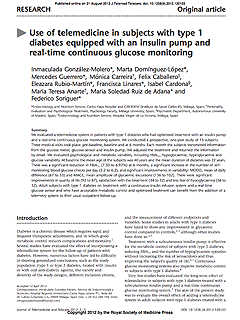 Those multiple daily injections subjects who switched to sensor augmented pump therapy at 12 months achieved 0.5% A1C reduction – used sensors 60% of time to achieve this.